Managing an emergency lighting installation in a large building is a very costly business, both in the time that it can take to physically check every luminaire and the associated labour cost of doing that work. If we add to those costs the need to keep a building fully operational even while emergency lighting tests call for batteries to be discharged, then it’s clear that we have to find a better solution to current practice. Automatic testing is taking the place of regular physical inspections, but many of these systems call for additional control wiring to the luminaires. RP-Technik’s answer lies in the latest wireless technology. 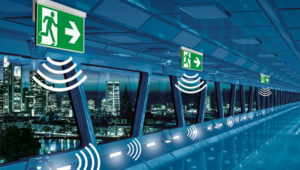 RP-Technik introduced its WPS Wireless Professional System for automatic testing of emergency lighting in 2012. WPS covers all sizes of commercial operation. As well as Wireless Basic for self-contained emergency luminaire installations up to 50 luminaires (released in the first quarter of 2018), RP-Technik offers the WPS 2.1 system, which provides testing for wireless installations of up to 1,000 luminaires (each system). And by means of a common web-based interface (LAN), separate systems (be they wired central-battery systems or other WPS installations) in different parts of a building can all be controlled centrally, so it’s possible to integrate different installations into one single monitoring regime for up to 50,000 luminaires. 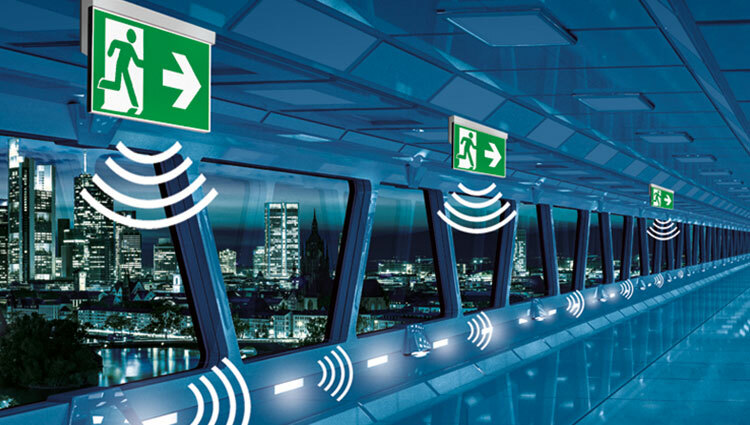 The Wireless Professional network operates at a radio frequency of 868MHz, which allows the installation of emergency lighting in areas where other sensitive electronic devices are in use, such as hospitals and laboratories. RP-Technik Wireless Basic luminaires communicate via the Bluetooth low energy mesh network protocol. This means that each in-fixture wireless module is both a transmitter and receiver of information, building a single reliable and robust communications network. However, Wireless Basic requires a mobile device (Android) while WPS requires a central station (PC) which must be installed and up running permanently – but, of course, can be placed at any location in the building. Wireless technology also means that WPS 2.1 can be used when a building is undergoing a refit as well as new installations. It reduces cabling requirements and installation costs. In addition, luminaires can be added to the network at any time without requiring any major reconfiguring of the network. The WPS system is designed to provide full statutory monitoring of the emergency lighting. Reporting can be scheduled according to need with status and error reports being delivered by email to the system administrator. As well as delivering data from the WPS network to local devices, records are also stored in the online portal Lightlinx, the RP cloud-based database (currently supporting Wireless Basic – support for WPS is in preparation). • Monitoring system according to EN 62034 type (Wireless Basic is type ER, while WPS is type PERC).